If so, why do the cats try to kill their trainers? Notice how they always try to get the press to downplay the attacks. 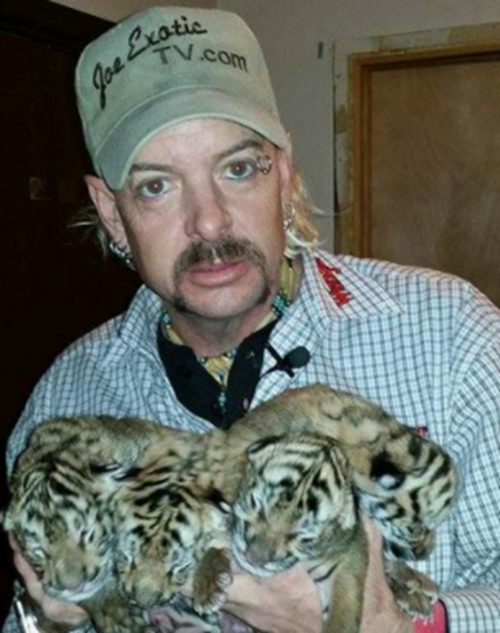 Young Vicenta Pages and her six Asian white Bengal tigers arrived at the Shelby County Fairgrounds a week early on Monday after a Muncie, Ind., engagement was canceled. 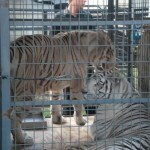 A new mom with her first child, Pages, 26, and her tigers are safety billeted in a shady corner of the local fairgrounds, the tigers napping in their sturdy cages and Vicenta and family in her air-conditioned motor home. Pages, of Native American and Cuban American heritage, is the only woman training big cats today. 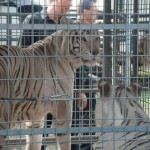 She performs alone in the show ring with her six striped charges. 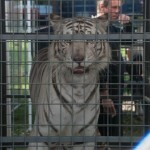 Her family members, on both sides, perform with animals, aerials and most every circus act. Vicenta has toured with Ringling Brothers Barnum and Bailey and also been part of the Pages Circus. 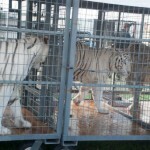 Beginning Sunday at the 152nd Shelby County Fair, Pages and the tigers will be performing free shows at 4, 6 and 8 p.m. daily through July 28 next to the fairgrounds gazebo. Performances are sponsored by the Sidney Daily News and Hemmelgarn Services Inc. 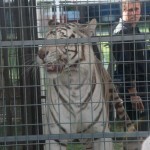 Pages said she prefaces each show with information about the tigers, and how they’re trained and cared for. At her bidding, the big cats will be standing on their hind legs, doing walks, sit-ups, rollovers and other routines. Asked if she has ever had any close calls with her charges, Vincenta shook her head. “No, they’re all well-behaved,” she said. Vincenta says her cats are fed 60 pounds of beef and/or chicken a day, all purchased from Walmart stores. 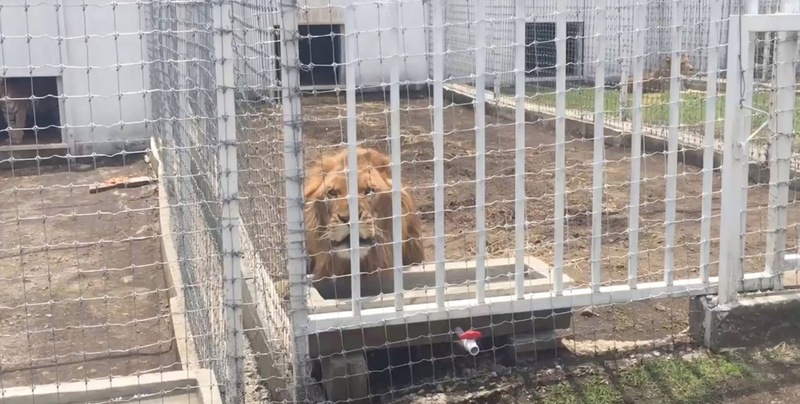 Their fresh meals cost about $560 a week. 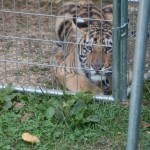 The tigers, four females and two males, variously weight from 300 to 500 pounds. 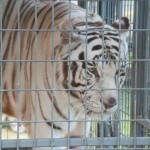 The act travels nine or 10 months a year, returning to winter in Florida where the tigers and Pages plan the next season’s fair and carnival itinerary. 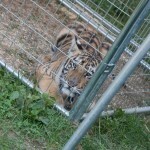 Their fairgrounds site in Sidney includes a horse and 3-month-old tiger cub Vicenta says she “adopted” in Indiana. The show’s next engagement takes them to Hale, Mich., in August. Vicenta is a fifth generation performer, her father is Jorge Pages Jr. of the Pages circus family which originated in Cuba and arrived in the US as Circus Pages. Her mother is Frieda Logan-Pages who is the daughter of former Clyde Beatty Cole Bros. Circus elephant trainer Fred Logan. She began performing on trapeze at one, trampoline at four, on ponies at age 8 in her first solo act. It was around that age when she asked her father when she could join him in the arena with the tigers, he told her when she was older. 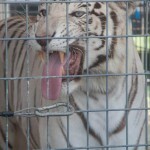 At age fourteen she reminded him of that fact and she joined her father in the presentation of the family tiger act. At 18 she began performing solo with the tigers. At age 19 she began a tour with the Ringling Bros. Barnum and Bailey Circus. Her run with Ringling Bros. ended on Labor Day 2009 and Vicenta is now reduced to performing at fairs, festivals, special events and possibly theme parks throughout North America.